Note: Yes, I know iPhones will be useless in post-apocalyptic America. Also, there's a little homage here for all you Repo Man (the movie) fans. 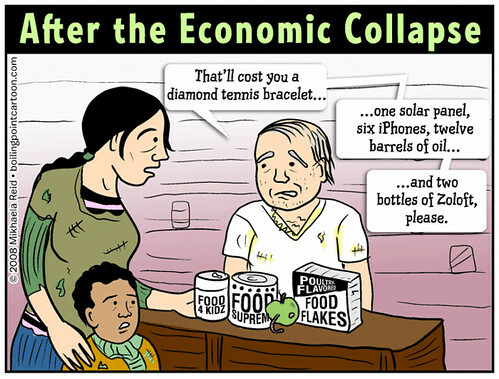 Economic collapse? (Looks innocent) WHAT economic collapse? We're just in an economic downturn right now. It's because of Al Queda. We're not in a...a..."recession"! And we're not in any danger of being in a recession, at least until January 20th, 2008! Oops...that should (TERROR!) have read January 20th (IRAQ!) of 2009 (911! )...it's all bin Laden's fault. PLEASE get a life ! The USA is already in a total recession,as if you cannot feel,and understand it. Vote more and vote to continue this slump when you vote republican. Why can't we have surplusses like CANADA at 14 billion & pay down on our national debt ? We in the US under Bush are obviously doing something wrong. Um, loyalist, you...uh...you may want to watch where you're walking so that you don't step in any of the dripping sarcasm from my comments. Oops, too late...that's gonna stain. Under the shrub, we're "not" (sniff...sniff...sarcasm) in a recession (yeah, right)...but on January 20th, the date I mentioned, the new president is sworn in, so shrubya can relax and call it a recession at that time to make the new president look bad...unless it's his "drill every square inch of land for oil and send more future body-bag contents to Iraq" clone, McCain.